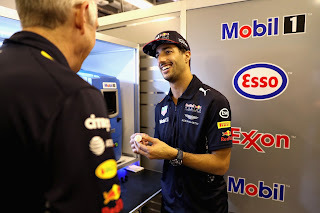 Daniel Ricciardo recently swapped driver duties for an engineering masterclass, working hands-on with the ExxonMobil trackside team and learning about the critical role Mobil 1 race lubricants will play in this weekend’s Abu Dhabi Grand Prix. The Australian Red Bull Racing driver underwent a technology lesson from Mike Frost, ExxonMobil Motorsports Technical Advisor, in its trackside laboratory. This included testing a Mobil 1 sample, and learning the science behind the race lubricants and fuels directly attributed in the closest qualifying sessions this year to scoring one place higher on the grid. Looking ahead to that weekend’s Abu Dhabi race, the Yas Marina circuit presents a unique set of challenges for the ExxonMobil trackside engineers. The track demands sharp acceleration between turns putting stress on the engine and gearbox. The dusty conditions in the desert also require specific monitoring of the fuel, lubricants and testing equipment to ensure zero contamination. Be the first to comment on "Daniel Ricciardo Becomes Mobil 1™ Engineer At The Abu Dhabi GP"